In Meant To Be, we discovered the power and versatility of executing a shift while taking the cards out of the box. This particular project shares a completely different card case shift that is extremely practical, versatile, and deceptive. I have been sitting on this for quite some time, and have finally decided to share these secrets. This can be done with any deck of cards. There are no edge-markings, shaved cards, or any other system that may be used to create a reference point during execution. There is not a hole in the box. Though a slight modification is still needed, it is not something a spectator would see and consider gaffed (as would be found with some previous methods). This modification can easily be made in two seconds (impromptu). No dumping action. This technique has a sure grip and load, increasing reliability and stability during execution. This is also much easier to execute for the average performer. Improved angles of execution and moments of misdirection. The Flip Shift is definitely a strong tool for memorized deck workers interested in "jazzing" as it gives instant access to any card named, or any portion of the deck. The purpose of this booklet is simply to share the technique at hand. I have included my personal routine for this technique (Influenced) which is actually outside of the ACAAN plot. I have also detailed how to utilize the Flip Shift to accomplish an extrmely direct, real time ACAAN featuring all of the conditions offered in Meant To Be (and more). The notes on motivated movements to execute this type of technique alone are worth more than the asking price. As a bonus for those that have Meant To Be, I share how to execute the Meant To Be system with a completely normal, unmarked deck of cards. Please note, this is not a full description of the system, and will only make sense to those that have read Meant To Be. 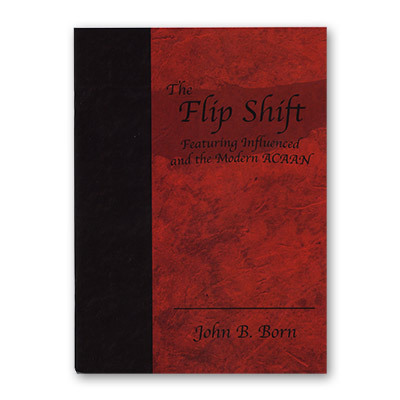 The Flip Shift is a "must have" tool for anyone interested in taking memorized deck work to the next level.